Multilink fun to explore odd and even. We built on our understanding by building the numbers from cubes and discussing whether they are ‘all paired up’ or have an ‘odd one out’. We are using a tens frame model to represent the numbers for odd and even. Once children had a good grasp of the concept they didn’t necessarily get round to making all the numbers with the multilink even though they were meant to! The worksheet is an old one I made a few years ago and I feel it is ready for an update to make it clearer and more enticing. 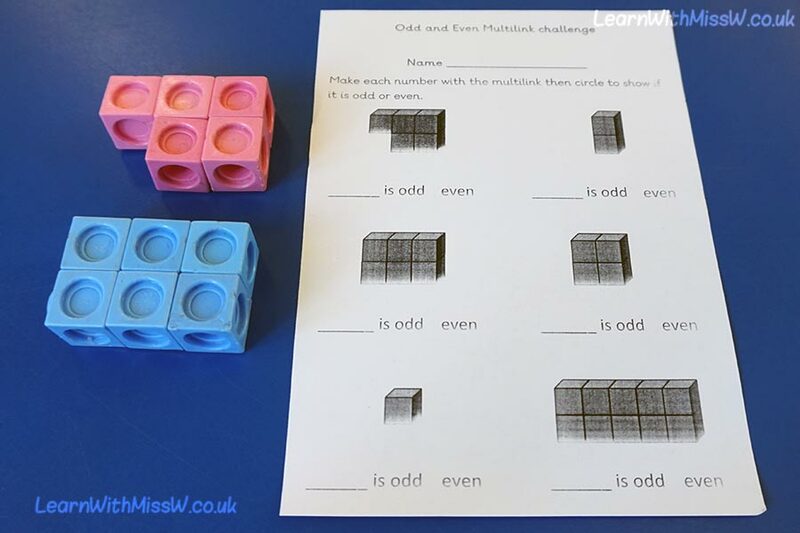 My emphasis is very much on the conversation and explanations around how children know whether numbers are odd or even. What other materials lend themselves to teaching odd and even? The multilink with was a bit tricky for small hands to click together.